It's a question many men ask themselves in the shower every morning: "When will I start to go bald?" Hair loss is one of the most common symptoms of aging, and in fact, over 50 million men in the U.S. suffer from hair loss, says hair expert Dr. Alan Bauman of Bauman Medical Group in Florida. Bauman adds that for the most part, hair loss is genetic, but this doesn't mean you're likely to lose hair as quickly as your parents did. Other factors like stress levels, taking certain types of medications or poor habits like smoking can all impact your risk of male pattern baldness. Last year, a study published in the Proceedings of the National Academy of Sciences proposed a new method of "curing" male hair loss: growing hair in a lab, according to the BBC. Researchers said while baldness therapies and transplants can work to slow down the hair loss process, creating new hairs from tissue samples would be able to grow new hair. There really is no specific age men should fear. Generally, the risk of losing your hair is proportional to your age, says hair expert Dr. Alan Bauman of Bauman Medical Group in Florida. "Hair loss can occur twenty per cent in your 20s, 30 per cent in your 30s and so on, including anytime after puberty," he says. According the American Hair Loss Association, by 35, two-thirds of men experience some degree of hair loss, and by the age of 50, about 85 per cent of men have significantly thinner hair. For men, male pattern baldness is the most common form of hair loss, Bauman says. Thinning begins at the temple and the crown of the head. 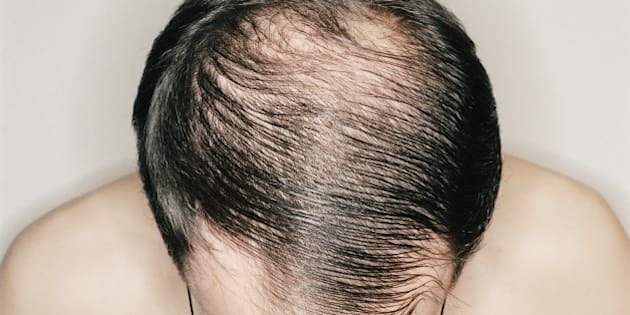 Over time, hair at the temple continues to recede, leaving you a central patch of hair at the front of the hairline and a growing bald spot at the crown. The baldness in the front will eventually catch up with the baldness in the back, leaving you a larger bald spot. For men, hair loss can be triggered by dihydrotestosterone (DHT), a breakdown product of the hormone testosterone that causes miniaturization of hair follicles. Based on DNA from both parents, we're prone to thinning hair any time after puberty. But just because your father is bald in his 60s, does this mean you have the 'hair loss gene?' Bauman says if you're really concerned, the best way to know is to get tested — genetic tests can predict the risk of hair loss for both men and women. Besides genetics, things like stress, the aging process, medications, inflammation of the scalp, poor diet, smoking or poor sleeping habits can all contribute to hair loss. While there are a number of preventative treatments available like nutritional supplements or low level laser therapy, in most cases, a hair transplant is the only way to permanently restore lost follicles. Bauman says one of the biggest mistakes people make is missing the early signs of hair loss. "A staggering 50 per cent of hair loss can occur before it’s noticeable to the human eye." If you are worried about losing hair, consult with a both your primary doctor and an experienced hair restoration physician — someone who specializes exclusively in the medical diagnosis, treatments and tracking of hair loss and regrowth.